A penalty save, and a rare misjudgement from Indian goalkeeper and captain Gurpreet Singh Sandhu, and a sublime strike from debutant Nishu Kumar defined India’s 1-2 loss to a strong Jordan team in the International Friendly at the King Abdullah II International Stadium in Amman on Saturday (November 17). The Indians were forced to play without regular striker Jeje Lalpekhlua, experienced striker Balwant Singh and the two regular wingers – Udanta Singh and Halicharan Narzary — as all of them were yet to recover after from their hectic travel to Amman, which included a 32-hour halt at the Kuwait International Airport after air traffic was suspended owing to thunderstorms and torrential rain. 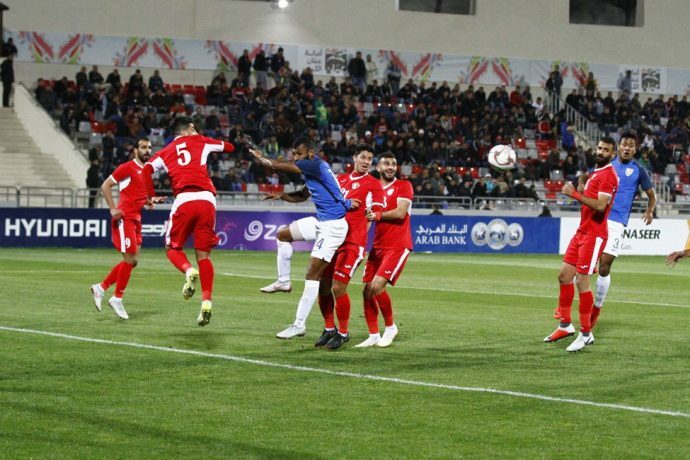 Jordan seized the initiative and kicked-off like almost a dream as they earned a penalty in the 7th minute. But Indian goalkeeper and captain, the Albatross under the bar, guessed it right. Even as Bani Atiyeh ran in with cheers from the stands expecting him to put it past Sandhu, the latter stooped low to his right to palm it, and then even managed to get himself in between to deny the rebound. Inspired, the depleted Indians chased and ran all over, the Jordanians finding it hard to break them down. The perseverance earned India their first corner-kick in the 21st minute but Vinit Rai failed to read the bounce of the loose ball and it cost him a decent try to lob it over the rival Goalkeeper Shafi who had come out of his line. Even as the Jordanians tried to counter and Pronay Halder went into the referee’s books the very next minute, little did anyone imagine that failing to read the bounce would earn Jordan their first goal, that too from Goalkeeper Shafi. Quite a fairy tale as it may sound, Shafi enacted it in reality. One of his long kicks sailed over the Indian defence and bounced. Initially, even as it may have looked a normal one, the bounce turned vicious as Gurpreet, who was out of his line misjudged it, and despite his desperate attempt to keep it away, it went in to give Jordan the lead. It was so ironic for Gurpreet, a mixed bag of joy and despair within a span of 17 minutes. The hosts didn’t allow the momentum to slip and could have doubled the lead in the 43rd minute but Faisal, all in the clear failed to tap in a Haddad cross. Changing over, Haddad felt best not to rely on any and finished off a brilliant counter-attack to double the lead for Jordan in the 59th minute. Head Coach Stephen Constantine brought in two changes introducing Ashique Kuruniyan in place of Jerry Lalrinzuala and then Nishu Kumar made his International debut coming in for Jackichand Singh. And the debutant scored within minutes! Germanpreet Singh managed to get one into the box and Anirudh Thapa who was fielded as a striker managed to draw away his marker to allow space for Nishu who was lurking behind to bang it in. Nishu didn’t disappoint. In the 73rd minute, Jordan earned a free-kick in the zone, just outside India’s 18-yard box. But Faisal’s placement hit the wall and got diverted for a corner. Thapa had a try in the 81st minute when he pounced on a loose ball outside the box but his curler hit a rival defender on the way. With the International Friendly allowing 6 official changes, Constantine went for a double substitution — Sumeet Passi coming in for Thapa, and Narayan Das substituting Germanpreet. Jordan survived a scare in the 87th minute when Narayan’s corner was flicked at the near post by Passi but a diving Halder just failed to make the touch. It was so close yet to far.